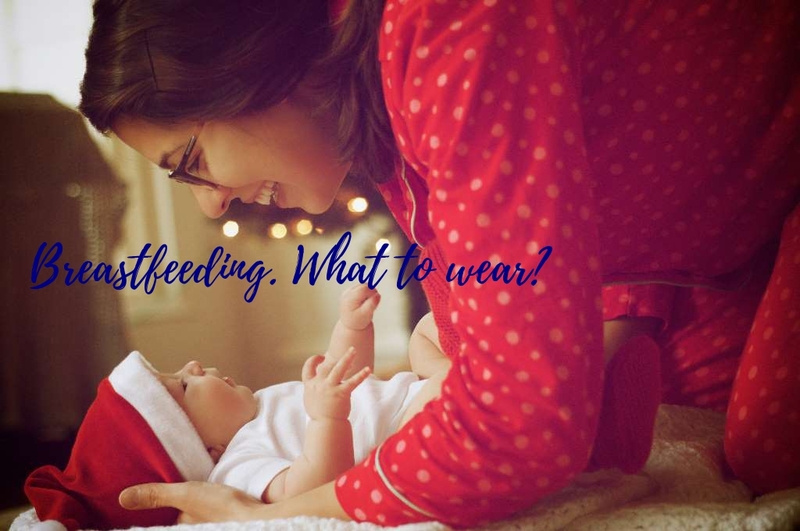 Make breastfeeding somewhat easier with the right clothes! Lulibelle > Breastfeeding > Make breastfeeding somewhat easier with the right clothes! Breastfeeding. Some people find it so easy and natural and have no problems whatsoever. I was most definitely not one of those people! I struggled so much with it, I cried on a daily basis, I had mastitis 7 times, and my baby had such bad reflux that he threw up almost everything I ever fed him! One of the big issues I had though was what to wear. At home I seemed to permanently have one breast hanging out with a baby attached to it, however when I was out and about I didn’t think that was a good look for me!! I really struggled to find nursing clothes and ended up always wearing vest tops under other tops and felt like I never looked nice, plus it was winter so I was always freezing! 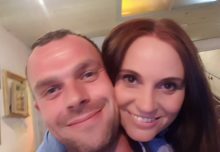 Because of this I make sure I always have a good range of nursing clothes in stock here at Lulibelle now so that other women can go out with more confidence than I had. This jumper is fab, with a build in vest top underneath you can simply lift one side of the grey part and hey presto! No faffing, no need for scrarves or wraps over the top for privacy. At only £28 and made from super soft cotton it’s a fab buy. 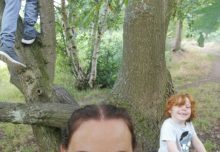 Click here to have a look! This navy and beige striped jumper is great for this time of year. It has access buttons up either side that look like a great style feature but also add practicality so you can keep your stomach covered up whilst feeding. £32 and worth every penny! Take a look here. Exactly the same as the striped jumper above but with a different style and colours. £32, click here to have a look! 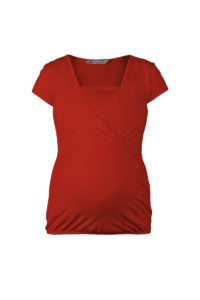 This is a classic cap sleeve maternity and nursing top which will take you beyond your pregnancy and allow for nursing access. 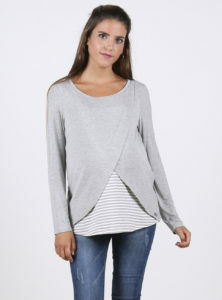 The cross-over design is flattering and has a hidden panel for breastfeeding. This versatile top looks perfect with a pair of skinny jeans and pumps or a tube skirt and heels at the office. £25. See the other colours here! This drape necked, cross over jumper is perfect for discreet feeding, leaving the rest of your body covered up so you aren’t being fully exposed to the wintery elements! £34. Available in more colours, pick your favourite here! 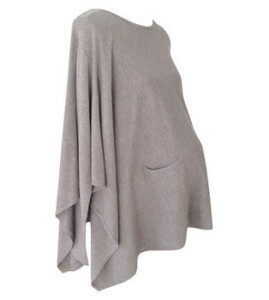 This poncho jumper is one of my favourites, I’m not pregnant or breastfeeding and I still wear it all the time! It has slits up the sides so you can pop a vest top or nursing top underneath, have an extra layer over the top to keep warm and n0ot have to take it off for feeding! It looks great with jeans and is available in various colours and even better, it’s in the sale for £30!! Take a look here. This dress is fab for winter and super stylish. Wear it over leggings or tights with boots or heels for a versatile look. Dresses can be hard to wear when breastfeeding but the designers of this one thought ahead and added zips on either side at the top for easy access without having to embarrassingly hoist up the whole dress and be banished for flashing! At £42 it’s a great buy as you’ll get so much wear out of it and not feel like you have to wear jeans and a top all the time! Buy it here! Another fab zip dress similar to above. Again £42. Which one will you buy? Get both! Here’s the link! Jumper dresses are so on trend at the moment and just because you’re nursing doesn’t mean you have to miss out, you’ll love this! A dress version of the jumper further up, the same cool button access design and supersoft, comfortable material. £42. Buy it here! Going to a Christmas party with your new arrival and want to get dressed up? We’ve got you covered! This fab dress has a gorgeous silver beading detail and flattering v neck crossover design with a hidden nursing function. £45. Get yours here! Want to see the rest of our Nursing range? Click here. Don’t forget it’s free UK shipping and returns for orders over £30 and we also ship worldwide! Spread the word and share with any pregnant or breastfeeding friends! Are you pregnant and feeling the heat?